Doors open at 5 p.m., show starts at 6 p.m.
General Admission $49.50. Service fees not included. The band’s latest album, The Desaturating Seven, marks the return of the definitive Primus lineup: Claypool, guitarist Larry “Ler” LaLonde, and drummer Tim “Herb” Alexander. It’ll be the trio’s first album of original music together since 1995. 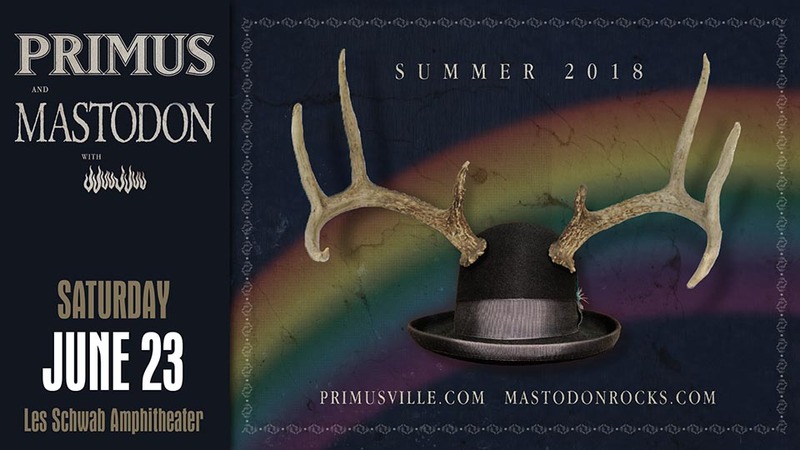 Joining Primus at the Les Schwab Amphitheater is progressive metal maestros Mastodon. The band won the 2018 Grammy for Best Metal Performance for the song “Sultan’s Curse” and was nominated for Best Hard Rock/Metal Performance Grammys in 2007, 2014 and 2015. Psychedelic rock up-and-comers JjuuJuu will open for Primus and Mastodon. Founed by Phil Pirrone, a longtime Los Angeles-based musician and festival organizer, JjuuJuu released its debut album, Zionic Mud, this past April.